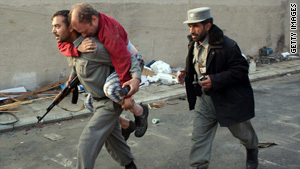 An injured man is carried on the back of a policeman following the attack in Kabul on Wednesday. Kabul, Afghanistan (CNN) -- The United Nations is reviewing its security procedures after an attack on a private guesthouse in central Kabul killed five U.N. staff members Wednesday. However, the agency's leader said it would not blink in carrying out its "noble mission" in war-ravaged Afghanistan. Speaking to reporters at the United Nations, Secretary-General Ban Ki-moon told reporters that the United Nations remains committed to working in Afghanistan, where workers from the world body have been helping the fledgling government plan a second round of the country's flawed presidential elections. In addition to the five U.N. staff members who were killed the carnage also wounded nine others, Ban said. The U.S. State Department said one American working for the United Nations was among the dead. Of the non-U.N. employees, three Afghans were killed. Ban said there were at least 25 U.N. staff members at the guest house, including 17 members of the U.N. election team. "This is a sad day and very difficult day for the United Nations," Ban said, condemning the "shocking and shameless act and the terrorists who committed this crime" and noting that the incident is a reminder of how tough the U.N. job is in Afghanistan. Ban said he was assured by Kai Eide, the top U.N. official in Afghanistan, that Afghan President Hamid Karzai has instructed his Interior Ministry to provide strengthened security, and he said the United Nations will also take necessary measures to beef up security -- in other areas of the country as well as Kabul. "We will, of course, review our security procedures, as we do regularly for the Afghanistan mission as a whole. We will take all necessary measures to protect our staff," Ban said. In the strike, weapons fire and explosions pounded the heart of the capital starting about 6 a.m. local time. The fighting began as sporadic gunfire, but intensified over time, lasting more than an hour. The attack took place in a relatively secure section of the capital, in the vicinity of a number of government buildings, and the firefight, which included machine-gun fire and rocket-propelled grenades, appeared to be concentrated near the guesthouse. A plume of black smoke rose from the compound. The Taliban claimed responsibility for the attack, saying on an insurgent Web site that three militants killed 50 foreigners, who were election organizers. The claim did not include specific details and could not be independently confirmed. The violence comes 10 days ahead of a presidential runoff election on November 7. Taliban militants have threatened to disrupt the polling. Officials said three militants were killed. One was shot dead by an Afghan soldier, and another wearing an explosives vest died when it was detonated. Karzai condemned the violence, as did the United States and the European Union. The second round of the presidential election -- a runoff between Karzai and Abdullah Abdullah -- comes after a first round marred with complaints of fraud, and the polling has led war critics to question whether the United States and other nations should invest their money and lives in a country where the government appears corrupt. Ban addressed the problems of government corruption and the drug trade, saying that he has urged Karzai to deal with the issues. If the matters aren't confronted, Ban said, it will not be possible to expect to have a credible government. He also urged the Afghan government to engage in politically conciliatory dialogue with many ethnic group leaders and regional country leaders. There had been an increase in international troop levels this year to provide security for the Afghan election in August, and the United States is considering the deployment of more troops to the country. The issue of security came up at the daily White House news conference. Spokesman Robert Gibbs said the administration is confident there are "appropriate resources to conduct the election and that the Afghan process won't be thwarted." CNN's Chris Lawrence and Tom Evans contributed to this report.